1 of 3 In a medium saucepan, bring 2 cups water to a boil. Add quinoa and salt and stir. Cover and reduce heat to low; simmer 12 min, until water is absorbed. Remove from heat, fluff and let stand, covered, for 15 minutes. Remove lid and cool to room temperature. 2 of 3 Stir parsley and pistachios into cooled quinoa. 3 of 3 Divide quinoa evenly among 4 bowls. 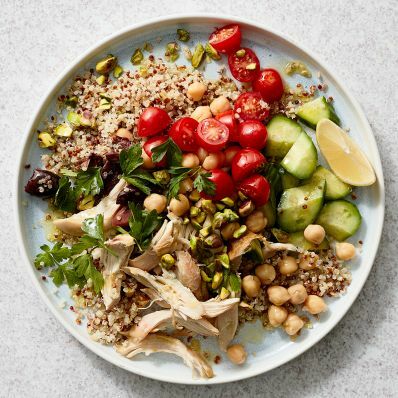 Top with tomatoes, chickpeas, olives, cucumber and chicken. Serve with lemon wedges. Per Serving: 17 g Fat, total, 2 g sat. fat, 452 kcal cal., 7 g fiber, 5 g sugar, 31 g pro., 1030 mg sodium, 47 g carb.